A classic favorite among the Nomos line, and a personal favorite because of the handsome Roman numeral dial. This watch is extremely comfortable to wear thanks to its uniquely designed lugs. Beautiful silver plated dial with Roman numerals. The dial contains an off-center subsidiary seconds dial. The dial is first sand blasted, then bathed in silver to provide the unique Nomos coloring. The baton hands are made of polished steel and then flame blued. And last but not least - the strap. Nomos watches use hand stitched straps made from Shell Cordovan. The leather is very smooth, durable, water-repellent and extremely long-lived. "The finest watch you can buy it this price point"
Verified Owner Comments: I like the overall design and simple yet classic functions of this watch. 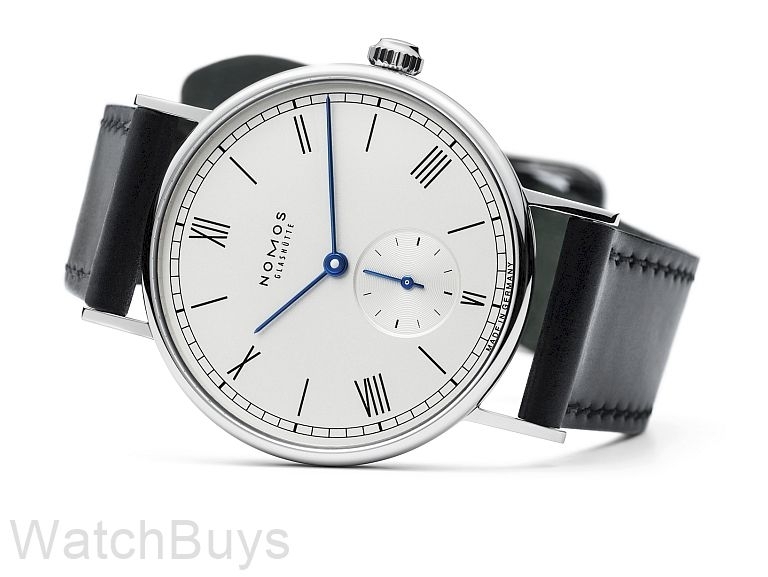 I feel that in today's competitive world of watches, whereby watches are being made to be the size of dinnerplates, Nomos provides an overall good quality watch that is not blingy...hopefully, they maintain this tradition!